Welcome Instapundit readers. Thanks, Glenn. After reading below about Argentina’s decline, several people have emailed to ask how Chile compares. Ask and ye shall receive. This post from last month shows shows Chile, Argentina, and Venezuela. Very powerful, which is why I gave the post such a grandiose title. There’s been a lot of coverage of the recent decision by Standard & Poor to warn that the United States has a “negative” outlook. As Joe Biden would say, BFD. I’m stunned that anyone would care, particularly since the rating agencies have zero credibility. These clowns completely missed Enron. They missed the collapse of Europe. They blew it on the financial crisis, especially with regard to the corrupt government-created mess at Fannie Mae and Freddie Mac. One of the problems with the rating agencies in this regard is that they narrowly focus on the ostensible ability of an institution (such as a company or government) to repay debt. That’s an important consideration, especially if you are a bondholder, but (even if the rating agencies did a good job) it doesn’t tell us much about why a government is in good shape or bad shape. This story – and the failure to recognize what’s truly important – is doubly irritating to me since I’m in Buenos Aires for the Mont Pelerin Society meetings. Many of the speakers have focused on the challenges in Latin America, with a lot of attention focused on what went wrong with Argentina. If I was forced to compress all the analysis into one brief answer, the problem is crony capitalism. Argentina’s economy, for all intents and purposes, is one giant Fannie Mae/Freddie Mac/Obamacare/General Motors/Goldman Sachs Obamaesque dystopia. Government has enormous influence over every major economic decision. It’s like being in the middle of Atlas Shrugged, as political connections are the way to get rich. This type of approach is far worse than the Scandinavian welfare state. Yes, the official size of government is bigger in places such as Sweden, but the negative role of government intervention is far more pervasive in Argentina. What makes this so tragic is that Argentina used to be one of the world’s wealthiest countries. Last night, I had the privilege of listening to one of the nation’s leading free market advocates, Dr. Ricardo H. López Murphy, talk about Argentina’s history. In the 1800s and early 1900s, Argentina looked to the United States for inspiration (back in the days when government was a far smaller burden) and he noted that his country was remarkably successful. Then, beginning around the 1940s, Argentina began to march in the wrong direction. As you can see from this chart, the consequences have been tragic. The nation’s relative ranking has declined precipitously. A country that used to be one of the world’s richest has now fallen way behind. 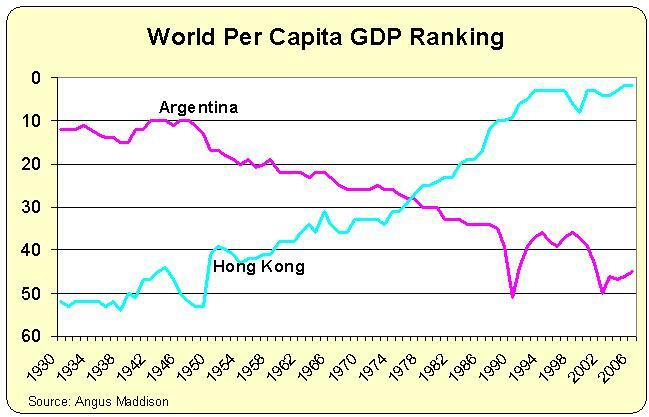 I also put Hong Kong on this chart to give further evidence that policy matters. Argentina has pursued an Obama policy of government intervention and has declined. Hong Kong has practiced laissez-faire economics and now is one of the world’s richest jurisdictions. This is a warning to America. There is nothing magical about the United States. If we copy Argentina (actually, a very bad combination of Argentine-style crony capitalism and Swedish-style high-tax redistribution), we will suffer similar consequences. I actually like what you have acquired here, really like what you’re stating and the way in which you say it. You make it entertaining and you still care for to keep it wise. I can not wait to read much more from you. This is really a wonderful web site. What about Peru? It seemed very vibrant when I was there last year. And the big boy Brazil? That’s a great article. Government is a dual edged sword. In its attempts to protect its people and the environment, encourage education and support equality, it expands and creates a burdensome beaurocracy that often makes lousy choices worse than the problems it’s trying to solve. It’s a balancing act that should be viewed as a pendelum. Richard, are you saying that Hussien having a round of golf with the CEO of GE is an example of big gov and and a big corporation being friends? I almost got to write this without a chuckle. What has happened to our country? I have 3 children and wonder what has happened to the place we will leave them. Thanks for the informative article. Any suggestions for what we, the thrifty, should do with what capital we currently hold? I don’t mean buying precious metals, I have read my history and know that if Roosevelt took gold away from the “pesants” who held it, then the current administration will likely take the same step. Maybe buying bushels of wheat and storing it in barrels would be a good thing, considering we’re heading towards food shortages so long as we convert it to alcohol and burn it in our cars. Another issue out there are the unrealistic earnings assumptions used in public employee pension plans to minimize the underfunded liabilities. WSJ had an article last week. Of 126 major plans, 89 assumed an average rate of return on investments of 8% or more. If they only achieve 6%, which is not a bad number, the current underfunding is low by a factor of 1.6 at 20 years, 1.9x at 30 years. And that assumes you stop putting anyone into the plan as of today. It gets worse as the population matures and the asset base to make payments shrinks. We are done if we start balancing the budget in 12. The question is how bad a beating we are setting ourselves up for. Mr. Obama and cadre want it to be as bad as possible. There is no other sentient explanation. Another issue out there are the unrealistic earnings assumptions used to minimize the underfunded liabilities. WSJ had an article last week. To Snorri Godhi. Why choose between those 2 evils. Why not choose real small gov free market capitalism, without the cronies. Having too much gov regulation of the economy, and too many gov subsidies, is what leads to crony capitalism. Big companies find it easier to boost profits by currying gov favors, than by the old fashioned way, producing a better product, more economically. Even big companies that initially did not want gov favors, like Microsoft, ended up having to curry gov favor anyway, when they got hit with their anti trust suit, and ended up hiring gov lobbyists out of self defense. That is why it is a lie when dems say libertarians favor big corporations. What libertarians really favor is small businesses and medium sized corporations, that are trying to become big ones. Big gov is the best friend big corporations have, since they end up controlling the regulators and politicians, and stiflying entry of smaller compeditors. If you are really afraid of the influence of big corporations you should favor less gov, not more. It is good to see a distinction between crony capitalism and the Nordic-style welfare state, since that undercuts the argument: “but look at Sweden!” But I’d like to see Mr. Mitchell expand on that: why do some countries go the way of crony capitalism and others the way of relatively stable welfare states? assuming that the welfare state is the lesser evil, how can governments avoid crony capitalism? I’d rather avoid the welfare state as well, in fact I emigrated to avoid it; but sometime one must choose the lesser evil. And any thing the dems ram down the throats of the country qualifies as the needed government regulated healthcare. Got it. You want to know why the ratings agencies didn’t warn us? and Barney Frank got up in “his” committee and threatened them. Their companies and their persons and their families. And bad news about the US unlikelihood of paying those bonds off ceased altogether. Betsy, “If you really don’t want goverment regulated healthcare, then you had better have really good private insurance with an agency that you can trust” in the end, you’re going to need that anyway. What do you thin kis going to happen to regulation enforcement when the government runs out of money? Victor Davis Hanson has written some great stuff on how the state of California has stopped enforcing lots of regulations in the impoverished Central Valley. In 2009 the dems completely controlled the gov, and did not have to compromise. They paid the price for it in 2010. If the repubs have a similar win in 2012, I would not expect them to compromise a lot either, although I still hope they can compromise on some things, as long as the necessary spending cuts occur, and Obamacare is repealed. But for now, they only control half of one branch, and if our gov is to actually function, they dont have much choice but to compromise. Boehner did not get what most of us wanted, but I think he got all he could, considering the recalcitrent, irresponsible, lying fools he was up against, and the support they had from similar lying fools in the MSM. If I see one party that is pushing for all the spending cuts they can get, and the other side constantly opposing any cuts at all, and both sides finally compromising on some cuts to keep the gov running, I know who to blame for the lack of cuts. If the repubs win the prez and senate in 2012, and still dont make big cuts, then I agree it would be time to raise hell, and throw the repubs out too, just like we did in 2006-2008. For now, the Tea Party, and the repubs are at least trying to do the right thing, in the face of irresponsibility and lies from the big spending dems. I didn’t mind seeing the repubs lose in 2006-2008, not because I thought the dems would do better (I knew they would be worse), but because I knew being out of power was the oly way to purge Bush style corruption from the repubs. With help from the Tea Party, we have mostly done that. I agree that Obama is the worste combination possible, of Fascist style crony capitalism, with European style big gov socialism, plain incompetance, warmongering without any determination to achieve victory, and little respect for civil liberties and individual freedom, combining the worste features of all these forms of bad gov. I have looked hard to find any instance of when Obama actually did something right, but haven’t found it yet. Wow! Such languange. Such simplistic analysis. Such spurious finger pointing. I can tell that this is an article intended to raise folks ire rather than an in depth analysis that will actually help solve the very real problems facing this country. I agree 100% that crony capitalism is a problem. That too many government agencies are failing in their primary mission of preventing the excesses to which purely capitalist markets are prone. We do have a crisis of government debt brought on by our own inability as voters to accept difficult choices by our politicians. But don’t pitch the baby with the bath water. If you really don’t want goverment regulated healthcare, then you had better have really good private insurance with an agency that you can trust. Without regulation, emergency rooms would not be required to accept anyone they didn’t want to, regardless of ability to pay. Excellent post. A few of us have been making the comparisons between Obamanomics and Peron’s Justicialism for a while now. One thing we have that Argentina didn’t is fairly strong lower-level state structures. The various way the states are handling similar problems – look at California, Texas, NJ, Virginia, Illinois, Wisconsin, et al – provide examples for the larger population to observe. Frankly, these various state examples lead me to think we are not going to follow Argentina without a conflict between the Obamunist crony-capitalist crypto-fascists and the lovers of liberty. It may be violent, it may be political, it may be some of both, but I think it is coming and the result will set the future course of the country. When the Dems win, their mandate to rule is absolute (Obama in 2009, “Elections have consequences. We won”). When the Reps win, it’s time for bipartisanship and compromise. As long as the Reps play by these rules, they are useless. Reps could have cut off Big Government at the knees by zero-funding everything not listed in Article I Section 8. Instead they passed a budget that cuts nothing, and will soon vote to raise the debt limit. Pretty soon, soldiers will be cashing their paychecks at Fort Knox while the bureaucrats in D.C. roast rats and pigeons over piles of burning BernankeBux. The graph I’d like to see is a comparison between Argentina and Chile. Overwhelmingly, the beneficiaries of state-sanctioned redistribution of wealth do not see themselves of having any other choice. As a result, they cannot fathom that those who are saddled by the state with the cost (i.e., the saving/investing class), in fact, _do_ have a choice. The sub prime meltdown may eventually prove to be the game-changer, with the investing class collectively deciding to place their financial “eggs” elsewhere. As a result, any measure that worked for the Treasury and the Fed in the past (such as the Stimulus, QE1, QE2…) will only make matters worse. Already, one-half of the earnings of the S&P 500 companies originates from business done entirely outside the U.S.
Mike, I agree with you that there is a lot of short term thinking, but would point out that it is mainly found among dems. Both the Ryan plan, and the Simpson Bowles plan have good ideas, and are large steps toward sanity. It is Obama and the senate dems that have repudiated both plans, while having no serious debt reduction proposal of their own. If Obama had followed his own debt commission, and endorsed Simpson-bowles, I would have had some respect for him. Simpson Bowles had more taxes than I care for, and does not do as much as I would like about entitlements, and thus I prefer Ryan. But at least it is a serious attempt to close the deficit, with real numbers and real proposals. Obamas proposal is a joke. It does nothing about entitlements, very little about spending, and resorts to magical thinking that somehow we can close the deficit by mainly taxing the rich. It claims deficit reduction equal to Ryan, but by the lie of extending his time horison out to 12 years, and claiming that reducing the deficit by amount A over 12 years (with I suspect most of the deficit reduction packed into the last 2 yrs, so we never see it), is somehow equal to the same deficit reduction over 10 yrs. Obamas budget speech is not a budget, it is a disgusting lump of campaign demagagery and lies. Until Obama starts to seriously lead on the deficit, instead of the head in the sand demagagery he is doing now, no constructive action is possible. If Obama refuses to lead, then the only way out is to vote him out in 2012. Hopefully that will not be too late. Until Obama, I didn’t think it possible that any president could have his level of incompetance and lies. Bush was no bargain, but Obama has embraced all the worste policies of Bush, added on immensly more spending and regulation, and combined that with complete incompetance, and a refusal to deal seriously with any issue. Clinton wasn’t always trustworthy, but at least he was competant, realistic and serious. It took a president as horibly bad as Obama to make both Bush and Clinton look good by comparison. I was saying this back in 2009 when Obama’s team racked up $800 billion in political payoff in the form of “stimulus.” I too used to travel to Argentina extensively, saw the State wrapped around every significant economic decisions and the politicized mess that resulted. We’re well on our way to copying the decline and fall of that lovely nation. It may be better that the US does collapse so that current arrangements can be dissolved and more prudent ones implemented. Because otherwise we’re marching towards Fascism and the only alternative remedy will be violence. We have way too much cronyism. In education, for example, schools too often do not hire the ‘best’ candidate, but one with “connections” to administrators or more powerfully connected teachers. Since schools are the ultimate state sponsored activity, they can ignore complaints and levy taxes at will, so teaching quality is never an issue. We need to take our lumps and dump a bunch of programs at one time. It would be better to do a bunch at once than to try to fight a program at a time. It breaks my heart to say this, but I really don’t see any way out for the US. The debate in this country is so shot through with short-term thinking, partisanship and demagoguery that I simply cannot believe that prudent voices will be heard (let alone allowed to lead). What we are watching in the US is how a great society dies. Based on the charts above, it’ll take another 30-50 years, but it’s a-coming.